One of the ways I focus my attention during a meeting is by taking notes. Over the past month or so, I have been in at least two meetings a week. During those meetings I have taken several Evernote’s worth of notes. The notes help me to pay attention to the ideas presented. Often my notes include ideas for reading material, action items to follow up on possible leads, and more. I have built a a system for quickly notifying myself about action items and additional reading when I take notes by hand. An open square will indicate an action. This square makes it very easy to check it off when it’s finished. I will put an asterisk next to something particularly interesting. This system is wonderful, but it is only as good as my review of those notes. A review allows for time to reflect about what I learned during the meeting, as well as to consider additional actions to take. 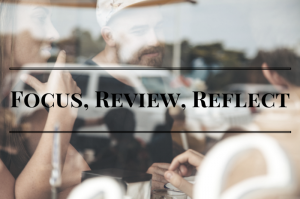 And, sometimes the review and reflection process simply allows me the luxury of synthesizing what I learned and really internalizing the information. Just like I wrote that you only get what you put in to an organization, it’s the same concept here. It’s great if you take notes, but if you don’t go back and review them, what’s the point? My favorite technique right now is to write a quick summary to post here on the blog. This works very well for events where there was a speaker and particular topic. There almost always are a few pearls of wisdom to share from any speaker. What techniques do you use to remember to go back and focus, review and reflect?